Published by Elandrian Press, Thomas Wildus and the Book of Sorrows is a new Middle Grade Fantasy by J.M. Bergen released in February 2019. Magic is real, Thomas. No matter what happens, always remember that magic is real. Seven years have passed, and Thomas hasn’t forgotten. He hasn’t forgotten the blue of his dad’s eyes either, or the tickle of beard on his cheek as they hugged goodbye. Last moments with a parent are memorable, even if you don’t know that’s what you’re having at the time. Now, with his 13th birthday rapidly approaching, Thomas’s search for magic is about to take a radical and unexpected turn. At an out-of-the-way shop filled with dusty leather books, a strange little man with gold-flecked eyes offers him an ancient text called The Book of Sorrows. The price is high and the rules are strict, but there’s no way Thomas can resist the chance to look inside. With the mysterious book guiding the way, a strange new world is revealed – a world in which Thomas has a name and destiny far more extraordinary than he ever imagined. But time is short. Even as Thomas uncovers his secret family history, enemies emerge, threatening to end his rise to power and destroy everything he holds dear. Through a fresh voice, genuine characters, and a unique storyline, Thomas Wildus and The Book of Sorrows is destined to appeal to fans of Harry Potter, Percy Jackson, and readers who enjoy books about magic and adventure. …Thomas froze, this time blinking furiously. When he could see again, he found himself staring at a shop on the other side of the street. A sign hung above a wooden door with slightly faded red paint. The lettering was too small to read, but there were splotches of purple around the edges. It was the only purple Thomas could see anywhere. He looked both ways and jogged across the street. The sign came into focus. H&A Booksellers, Purveyors of Fine Books and Rare Manuscripts. The words were painted in chipped gold leaf, with tiny purple flowers nestled in the arcs and whorls of the lettering. Thomas stared at the sign, his eyes following the path of the thin green vine that wound through the gold letters. Was it possible that a bookstore in this area had escaped his attention? Not a chance. Not one that was listed on the Internet anyway. But the shop was here, every bit as real as the humming man a moment earlier. Thomas felt an uneasy excitement in his chest. Cars zipped past on Main, but this street was practically deserted. He looked at the red door, at the plastic placard dangling from the nail in the center. Open. He contemplated his next move. The options were simple. Forget what had just happened and turn around in time to catch his bus home or go inside and risk being laughed at for the hundredth time. He reached out and pressed on the old-fashioned handle, forcing himself not to think about the disappearing man or the prospect of pending humiliation. The door swung open. The wide wooden counter and oversized green cash register looked as ancient as the faded lighting and worn carpet. The place was bigger than he would have expected, though, with shelves running far beyond the point where they logically should have ended. The size was just the first curious thing about the shop. Everything else was different, too. There were no racks of shiny best-sellers, no big display cases promoting glossy fiction. Instead, cloth and leather-bound volumes were stacked and piled and crammed together in an endless sprawl of dusty texts. Every shelf was chock full of unrecognizable old books. The place was a goldmine. Jackpot! Thomas looked at the placard at the end of the nearest row. The inscription stamped in tarnished bronze was faded but legible. Alch. Hist. 1127 – 1490. He reached for the nearest book, a tall, narrow volume wrapped in faded red leather, wondering what the inscription meant. The forced cough originated behind Thomas’s left shoulder. He turned, startled, and found himself eye to eye with a man who had thin graying hair, a sharp nose, and hazel eyes flecked with specks of gold. The man stood with his hands behind his back and wore a yellowed apron with the words In Liber Veritas stenciled on the front. “May I help you, young man?” The shopkeeper was only a few inches taller than Thomas himself. The wonder receded, replaced by a wrenching anxiety that knotted his gut and made his palms turn clammy. He could hear the scornful responses of the others he’d asked. Are you messing with me, kid? What, are you some kind of idiot? There’s no such thing as magic, dummy. Go on, get out of here. Fantasy and New Age? Really? Thomas’s shoulders slumped. He took a half-hearted step toward the back of the shop and paused, the knot in his gut tightening. As much as he hated getting laughed at, the idea of digging through piles of worthless books was as unexciting as the prospect of scrolling through another online ‘magic’ forum. If ever there was a place that might have what he really wanted, this was it. He sucked in a deep breath and turned around. “Never mind. Just forget about it.” Thomas spun toward the exit, his cheeks flushed and heart racing. Halfway to the door, he paused. The man wasn’t laughing. He was asking questions. That, at least, was different. Thomas turned around. The man’s unwavering eyes reflected the overhead lights, glinting with fragments of gold. Blue eyes stared at Thomas out of a distant memory, sincere and earnest. He felt the roughness of his dad’s calloused hand on his cheek, the tickle of soft beard as he pulled Thomas close and kissed his forehead for the last time. “Magic is real, Thomas.” Magic is real. Thomas nodded. The shopkeeper’s eyes were ageless, his stare unsettling. Thomas stood tall, refusing to break the connection even though his insides had turned to jelly. “What is your name, young seeker of magic?” The hint of a smile crinkled the subtle features of the man’s face. J.M.’s debut fantasy/magic series originally started as a bedtime story for his oldest son. The story turned into a saga, and one book turned into five. The first book in the series, Thomas Wildus and The Book of Sorrows, is scheduled for release in February 2019. 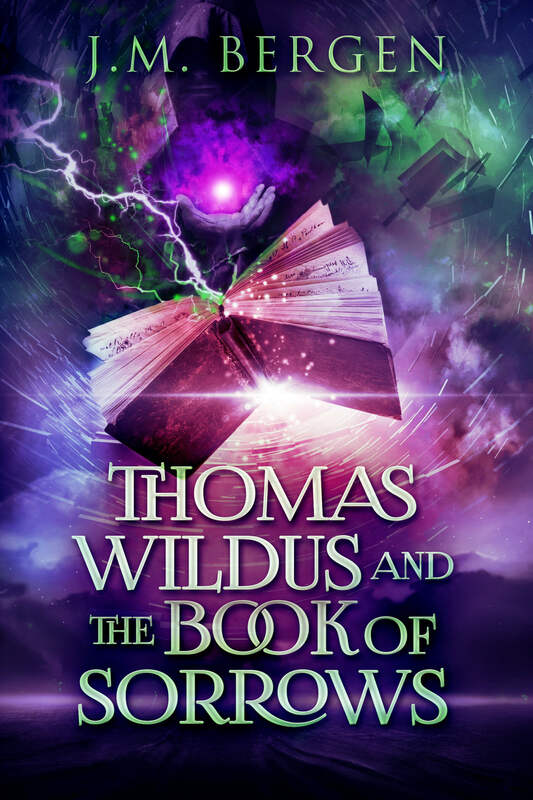 The second, Thomas Wildus and The Wizard of Sumeria, will be published in early 2020. When J.M. isn’t working on the Thomas Wildus books, you can find him playing with his kids, napping, or dreaming up new adventures. If you ever meet him and can’t think of anything to talk about, you might ask about Herman the Shark, the Kai and Eli stories, or why Riddle-Master by Patricia McKillip is his all-time favorite book. Or maybe, just maybe, you’ll have questions and stories of your own (if you do, he’ll think that’s far more interesting). To learn more, visit www.jmbergen.com.